We often hear people being tensed about improving upon their technical skills. What happens next? They do ace it and yet end up getting rejected. Why? When we are vying for something big, we only focus on working on the tougher parts. Alas, we miss out on working on the easier things. But, mind you, these little things if undone can cost you your job. Let’s stop talking in circles and get clear with understanding the importance of those little things which in our case is: working on the soft skills. But what are soft skills? So how does this add value to your Personality? You would be surprised to know that the thing you kept on neglecting is one of the main areas you must have worked on in order to fetch a job with ease. Many a time, you get selected just on the basis of your good communication skills. But it doesn’t work the other way round. Even if you possess great technical skills, but if you lack in your communication skills, the chances of getting a job fall way too low. In the professional world, communicating is what is done on an everyday basis. You would be required to talk to your clients, your bosses, managers, and so many important people. How would it appear to them if you talk in broken English? You would lose all your importance in one go. Even if you know a lot but if you lose out on expressing it, then what’s the use? Having the right attitude and taking an initiative to work well without round-the-clock supervision puts you in good light. It can be considered as a vital soft skill for any employee. If you carry yourselves with a positive attitude, people would like to be around you and interact with you. You could as well discuss ideas and hold other important talks. Not only does it validate commitment and reliability, but it shows that you can fit easily into any organizational structure without being constantly looked at. Anybody with this quality is blessed. And if you are not, better work on it. Any organization would look for candidates who possess this quality. This is so because you would be an asset to the company if you have those skills which are to manage people and other things. People with leadership quality know how to take an initiative or to handle things/people in an efficient way. In this way, a motivated person helps his/her colleagues to motivate themselves and then there is a group of motivated people working on several projects and getting great results. Have the courage to take responsibility for various things. It could be anything that happens in the office. Suppose some area of the office work is not doing well, then take the responsibility to make things right with the help of other resources of course. But do take responsibility in case of crisis. In this way, you prove to be an asset for the company and they would never want to let go of you as they know what importance you hold in the company. Be a team player. Do not ever try to take credit for everything. Work in a team, help your colleagues and make things done. Unlike college, the office works in a different way. There are just a set of targets that need to be achieved and it can be achieved if you work collectively. Team efforts matter and there is no use if you do a lot of work all alone and yet the target is not reached. You along with your colleagues should work in such a way that the end target is reached. As it’s said, work done together is work done well. This professional world is going to let you face a lot of problems every now and then. So, you must possess problem-solving skills in order to survive. There could be problems amongst colleagues or work-related problems. You have to be good at solving both. Be calm and friendly. Take efficient measures and work peacefully. Even if you are bullied sometimes, try to keep yourself distracted and think about positive things. People can only annoy you if they have power over you. So all that you need to do is not let them have it. Do not over think and just do your job and go home. Sometimes not engaging in negative discussions can help you find your peace. You must know how to make mindful decisions. You are going to be in a dilemma a lot of times. Instead of being manipulative, you have to take a stand and make a decision. There are no two sides to it. Either it is ‘white’ or it is ‘black’, but there won’t be any ‘grey’. You should know how to keep your mind intact and make wise decisions. You must know how to justify the decision that you made and keep proving yourself right. This means you have to know what needs to be done and be rightfully making decisions. Now, this professional world is going to demand a lot from you, and you have no choice but to give what your company needs from you. There are going to be times when you have less work and then the times when you have an abundant amount of work. You have to have the ability to work under pressure and meet deadlines in order to survive. Everybody is doing it and you should too. When you work under pressure, you not only have to just complete the work but you have to complete it in time. So here’s the catch. You not only have to work efficiently but you have to do the same within a certain period of time. Time management does play a crucial role. So you must know how to manage your time and also work in an efficient manner. You shouldn’t lose out on any of the two. This also happens to be one of those soft skills which recruiters look for in potential leaders aka YOU! In order to ace these skills, you must know how to be influential and be persuasive. Similarly, conflict resolution depends on strong interpersonal skills and the ability to establish a rapport with clients and colleagues alike. 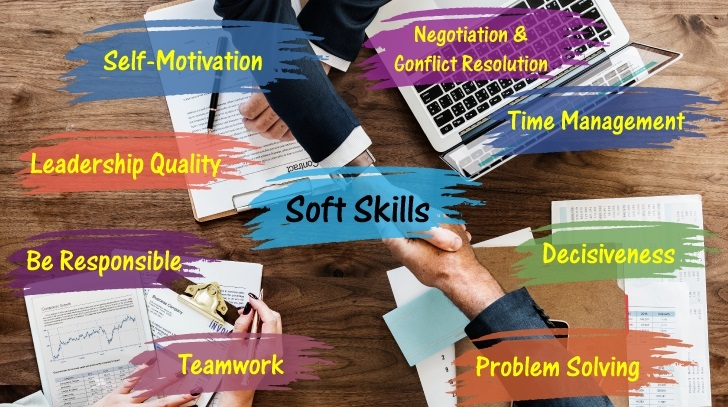 Now that you have been acquainted with some of the most important soft skills, you must start working on them already. Wishing you all the luck. Kudos!